I had the pleasure of training with Alistair for many years when we lived in Lenzie and the story of these great years can be read in the section on The Lenzie Lopers. We travelled to many races together but during every event we were in different races – his at the head of the field and min halfway down the field against totally different opponents! He was a great talent and fully deserved his victory in the marathon championship. Alistair is here as a runner but he has also been a first class official who always worked for the athletes – with his club, with the marathon club and now with the Scottish Veterans Club. He is also the only marathon runner I know of with the record of “Run Four, Medalled in Four” SAAA Championships – in other words he never ran without being in the first three! He was also what might be called a complete endurance runner – his personal best time from 800 metres up to the full marathon are very impressive and represent a wider range of talent than most marathon men. What follows is in his own words and then there is a report from ‘A Hardy Race’. “I suppose it’s fair to say that my running career was in two distinct phases. I started running at school in January 1963. I was encouraged to run at school and very soon found that I could compare favourably with guys who were members of the local club, St Modan’s AC; a club no longer in existence but highly regarded at that time. At that time, Mike Ryan, later to become an Olympic and Commonwealth Games medallist, international decathlete George McLachlan, and Scottish Steeplechase Champion Charlie Meldrum were all prominent club members. My very first race was the National Cross Country Championships, held that year at Hamilton Racecourse. In the Youths race, won by Ian McCafferty, I finished 40th and first counter in the team that took the silver medals. My first race and I picked up a medal in a National Championship! This business is easy! However, having left school my commitment dwindled a bit although I had been doing some running with Willie Scott who ran in the professional highland games. Willie convince me that what I needed to do was to join him on the pro circuit. At that time people like John Freebairn, Jimmy Bryce, Stuart Hogg and Eric Simpson, Arthur Rowe and the legendary Bill Anderson were all prominent competitors; and Olympics fourth placer Alan Simpson and former world mile record holder Derek Ibbotson were soon to join the pro ranks. After a couple of years experience I improved sufficiently to become one of the top performers in the middle distance events. Professional running in the Highland and Borders Games Circuits was all handicapped and runners brought up in the pro code were very careful not to expose too much to the handicapper. However, my background was different and as an amateur with St Modan’s I was in the habit of giving 100% in every race. That same background meant that I trained twelve months of every year which not all of my rivals could claim. I started the 1968 season with a decent handicap and won most of the races I ran which meant that my handicap was severely reduced as the weeks went past. However I had so much in hand that I was still able to win races from the back mark. 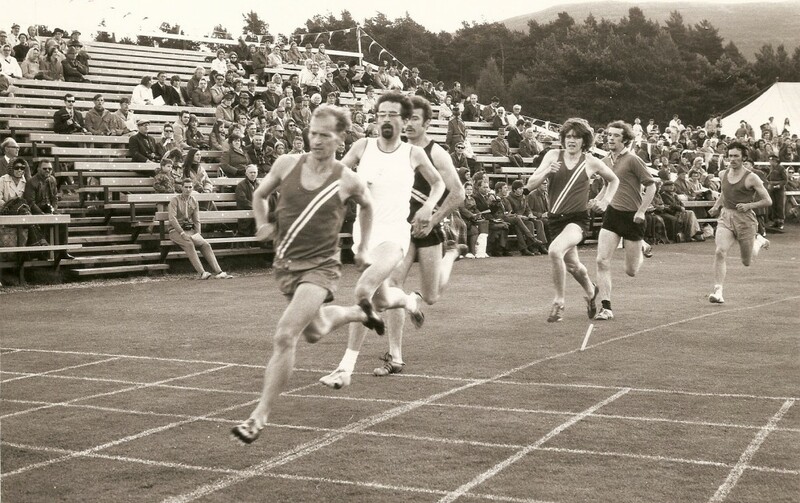 Some of the highlights of that summer of 1968 were mile victories at Hawick and Peebles, a half mile and mile double at Alva Games, and an invitation mile at Lauder where I prevailed after a race long battle with professional world mile record holder Michael Glen. The biggest day of the season though came at the Grasmere Sports in the Lake District where I won my heat of the 880 yards and then the final and also the mile to be awarded the trophy for the athlete of the day, unheard of for a track runner where they take their fell running and wrestling so seriously. Then to cap an eventful season came the New Year meeting at Powderhall. In the 880 yards I finished fourth in the Final but in the mile the following day I had to work hard to qualify for the final in a distant second place. For the final thjough, in spite of a heavy grass track, I was totally focussed as I got up to win in the last few strides from the back mark. For my efforts over the season I was awarded the Scottish Games Association’s Athlete of the Year Trophy. My training at that time was mostly track based doing sessions like 20 x 220 yards (pre-metrication) in close to 30 seconds with 30 seconds recovery, 2 x 4 x 220 in 25/26 seconds with two and a half minutes recovery and ten minutes between sets, 6 x 440 in 55/56 with five minutes rest, and I would sometimes do a ‘long run’ of 5 – 7 miles. In addition I did a lot of running at King’s Park Golf Course at Stirling, a lap of about 1.7 miles, very hilly over the first three quarters of a mile then very fast, flat running to the finish. Ideal running territory! 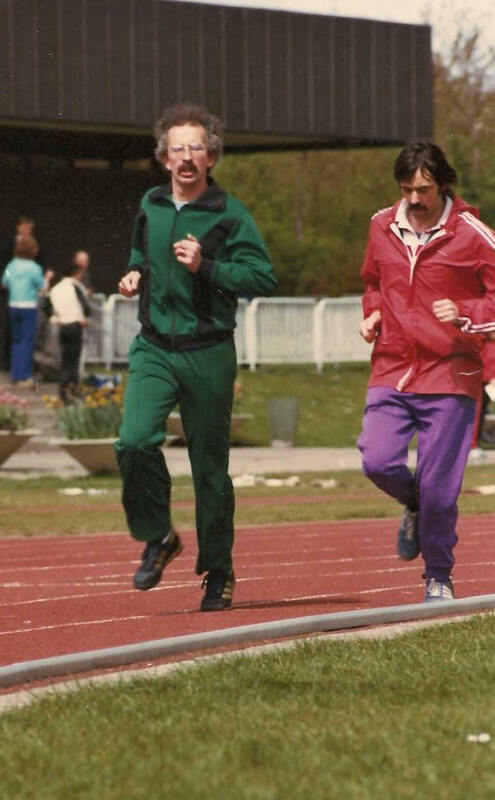 I moved to Lenzie in 1973 and feeling that my running could improve as an amateur, after three attamptes was eventually re-instated as an amateur, and joined Springburn Harriers. The club was strong at that time with Eddie Knox, Harry Gorman, Stewart Gillespie, etc, and I came under the influence of Bill Ramage. Bill introduced me to twice a day running and convinced me to try racing over longer distances. I ran the Balloch to Clydebank (a 12.25 miler in those days) in March 1974, though I had never run that far before even in training! After a cautious first half I came through to finish seventh in a race won by Jim Dingwall. A few eekslater I finished second to Willie Day in the Clydebank to Helensburgh 16 miler and followed up by winning the Lanarkshire 10 miles championship. In May I took the West 10000 metre track title from Innes Mitchell in 31:20 and in June beat Sandy Keith to win the Spean Bridge to Fort William 10 miler in 51:11. So things were falling into place for a stab at a marathon. In September I won the 14 mile road race at Shotts Highland Games and in October ran 2:29:43 at the Harlow Marathon, a race dominated by the Scots as Jim Wight won with Donald McGregor third, Jim Dingwall fourth, Colin Youngson eighth and Alex Wight tenth. I finished off the year in good company with a decent fourth place on the first leg of the Edinburgh to Glasgow Relay behind Messrs Youngson, Day and Alder. 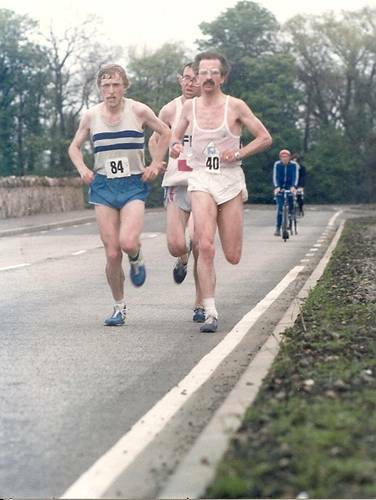 I retained my Lanarkshire ten mile title in May 1975 and reduced my marathon PB to 2:25:00 at the AAA race in Stoke, then ran 47:56 for twelfth place in the high quality Brampton to Carlisle with on Hill second in 47:02. I was never a fan of cross country but I had my best country run in the National at Drumpellier Park in February 1976 to finish twenty first, sandwiched between Peter Stewart and Willie Day.I finished fifth in the Tom Scott in 48:51 with Andy McKean, Dungwall, Doug Gunstone, by now my training partner, and Day ahead. In May along with Doug, Bill and Brian McAusland, I travelled to Rotherham for the AAA’s marathon and took a few seconds from my best with 2:24:44. Then in June I finished third in the West Districts 10000 metres track in another pb of 31:16.8 behind Dingwall and Day. A week later in scorching hot weather I took third in the Scottish Marathon Championship with what turned out to be my career slowest time of 2:30:14 behind Donald and Doug. Later that year I hit a decent bit of form as I finished first on the first leg of the E-G ahead of Mr Youngson. Colin says that he wasn’t well that day but I am still extremely proud of that run given every club’s expectations for the race and the pressure and atmosphere surrounding it; certainly one of the highlights of my career. The following week came another good run at the Brampton 10 miles as Ian Elliott got away from me in the last 600 metres, I was placed second with 48:04. In January of 1977 I won the Springburn Cup which has become the Jack Crawford Cup but then came a dormant period as I coped with one injury after another. However I managed to get back into some decent training early in 1979 and by the time of the Tom Scott was fit enough to dip under 50 minutes and take fifth place in a race won by Jim Brown. Things were starting to fall into place and by the Clydebank to Helensburgh I won by over a minute from Tommy Wiseman, Martin Craven and Gerry Gaffney. This victory gave me a big boost and two weeks later I won the Lanarkshire 5000 metres title in a pb of 14:50 from Hugh Wilson. Then it was on to the big one: the Scottish Marathon Championship and although I was very nervous I couldn’t fail to be confident given my preparation. And my confidence was justified as I took a huge chunk from my ob with 2:18:03 to beat the old masters, Donald and Colin! I never felt in trouble in that race, the least painful marathon experience of my career and I felt sure that I could improve on it. For my efforts that season the SAAA presented me with the Donald MacNab Robertson Trophy for the Outstanding Road Runner of the Year. Sadly, due to injuries I was not able to improve on that time but nevertheless I was still able to turn in some decent performances. At the AAA’s Marathon at Milton Keynes in 1980, I ran 2:25:51 and in the Scottish Marathon in June I came with a late run to finish third in 2:27:21 behind Graham Laing and that man Youngson again. In 1981 I made it four medals in four appearances in the Scottish marathon with another bronze in 2:22:25 with Colin winning and Donald second. However a couple of more months before that year’s race came an event that would change the face of running in Britain, the first London Marathon. Even with ‘only’ 7500 runners it was an unforgettable occasion and there was again a good Scottish representation as I ran 2:22:18. In October as a try out for the Glasgow Marathon, to come the following year, an international invitation event was held over a four lap course in the city centre. An Irishman finished first as I ran 2:21:01 for sixth place. My final marathon came in the Dundee People’s marathon in April 1984. I was in the leading group with Donald McGregor, Charlie Haskett and Murray McNaught who were to finish in that order, and Terry Mitchell until I got dropped at 18 miles. However with the arrival of Donald Ritchie on my shoulder things picked up and we passed Terry and I was able to outsprint Donald for fourth place in 2:19:56. Alastair (in green) and Doug Gunstone warm up at Coatbridge. 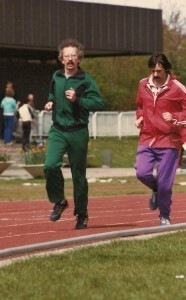 It is a very interesting account on a variety of levels – there are training details including rep speeds and recoveries, it tells the same tale as Allister Hutton and Jim Dingwall of the importance of spending some years on shorter faster distances and the inclusion of cross country and track in the marathon runner’s schedule is also highlighted. Alistair mentions the difficulties involved in getting re-instated as an amateur athlete: well do I remember some of it! I was on the SAAA General Committee at the time of his application for international re-instatement and hardly missed a meeting but it so happened that when Alistair’s application came in I was absent. It was turned down but when the next meeting came up in Edinburgh, I was there and raised the matter under Business Arising from the Minutes. I had spoken to other Committee Members in advance and knew that they were in favour of reinstatement. So when the time came I looked at the Secretary, Ewen Murray, and asked how much it would cost to have him reinstated. I was told seven pence ha’penny (the cost of a stamp in those days! Could we justify the request? The answer was yes we could in that he had run well for years and competed as an amateur for years, there would be no problem. So I proposed reinstatement, in the vote that followed no on voted against and it went through. And not before time. The story of his 1979 victory is told in ‘A Hardy Breed’ by Clyne and Youngson: “The Scottish Marathon Championship from Meadowbank on the twenty sixth of May turned out to be a fine one. After a year of injury free training and a blend of mileage and short or long repetitions, Alistair McFarlane was in very good condition having won the Clydebank – Helensburgh by over a minute and shortly afterwards set his fastest 5000 metres. By five miles (26:20) the leading group contained Alistair McFarlane (Springburn), Don McGregor, Colin Youngson, Ian Graves (Fife), Graham Milne (Aberdeen), Dave Lang (Fife) and good English fell runner Alan McGee (Bolton United Harriers). Gerry Gaffney (Greenock Wellpark), making his debut, was there too. The pace was steady due to a slight headwind. Halfway (70:23) was reached with a pack of six: McFarlane, Lang, McGregor, Youngson, McGee and Gaffney. According to Colin Youngson’s diary: ‘With the wind behind us, suddenly the pace of the return became suicidal – until legs dropped off!’ Gaffney and Lang were left behind by fifteen miles (80:30) and Alan McGee shortly afterwards. Donald McGregor slipped off the group at 18 miles and in the words of Alistair McFarlane, ‘at a watering point opposite Musselburgh Race Course – around twenty (1:46:07) and a half miles, Colin went for a drink while I kept running. So I was on my own, feeling good and running well, and knew that, although there were well over five miles to run, I would not be caught; a tremendous feeling to have in the later stages of a marathon when you are normally suffering a bit.’ Youngson simply remembers that on the day Alistair’s relentless leg speed was impossible to match – he really was in great form. McGregor, having paced himself more sensibly, passed Youngson but all three finished strongly to neat 2:20. Alastair is currently the secretary of the Scottish Veteran Harriers Club and doing his usual very thorough job. He appears at many races, is always to be seen at vets championships with his camera taking photographs for the club magazine and is coaching the seniors at Kirkintilloch Olympians club.